As I am writing this, Pyret is still alive, but only just barely. She is dying. 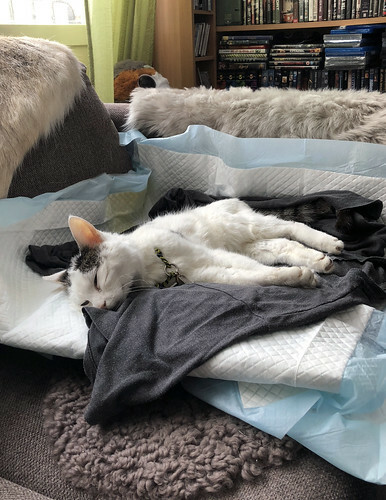 She is not suffering, and she is lying peacefully on one of Björn’s T-shirts in one of her favourite places. She is not in pain, she’s just 18½ years old and she’s simply slowly shutting down. We think that taking her in to the vet would cause her more stress than she needs, and the vet agrees. It’s a long bus ride, and she seems content to be here with us. The other cats seem to know that something is happening to her, and they have all come to see her during the day. I think they know she’s dying. 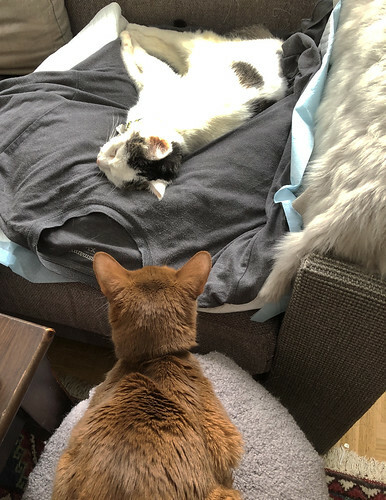 They have all been really gentle to her…which is amazing, considering that she hissed and growled at them whenever they came near her. It was really touching to see each of them come and visit her. Especially Logan. The youngest and the oldest. As I say, she is still here with us, but I don’t think it will be much longer. May StarClan light your path, Pyret von Rosenöra-Rosennos. May you find good hunting, swift running, and shelter when you sleep. There will soon be a new star in the night sky. Thank you for posting the photo of young Pyret – good to think of the beginning at the end. Hugs. I am SO sorry. We’ve been through it so many times. We lost an old cat last year. We put her in her round bed Christmas day and watched her as she slipped away. It’s never easy, no matter the circumstances. Our cats did the same; they came in turn and kept watch on her until she finally passed. My thoughts are with you and Bjorn. The photo of her in the basket is from her first Christmas at my parnets’ house back in 1999. She jumped into the basket, which my mother has painted, and the just looked pretty, the pink of her nose and ears reflected in the roses on the basket. 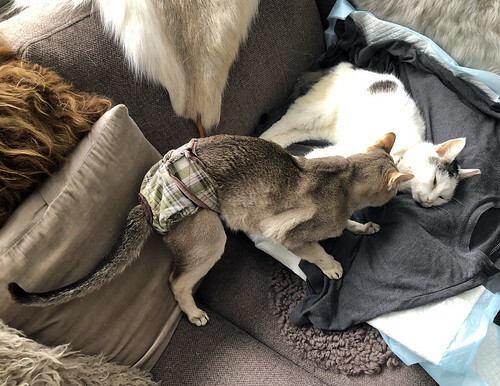 I’m so sorry… and it’s true, they do know that Pyret is making her transition. In 2014, the day before Sparkle died, both Binga and Boodie hung out with her (which they didn’t often do), and my human later realized they were saying their good-byes. She has had a few brief attacks of spasms tonight, meowing and thrashing feebly. I’ve been with her most of the time, trying to comfort her. It’s bedtime now. She’ll be in the bedroom with us so she won’t be alone. Sadly, my mom’s 17½-year-old Chartreux reached the end of his life just a few months ago. He just adored her and she adored him and he was an amazingly gentle soul. He protected her too, waking her late at night if something wasn’t quite right in the house. He was an only cat so it was just us who got to say goodbye with my mom gently rubbing his face as he faded away. My mom misses her fuzzy companion and friend terribly. I have often wondered if it made sense for cats in the home to be with a housemate cat as he or she passes on. Now I know. It seems to provide them some solace and a chance to say goodbye. 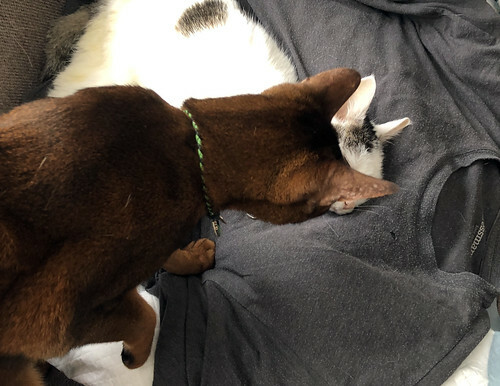 I have even read that if you have a cat euthanised, you should bring the body home to show the other cats that their friend is dead. 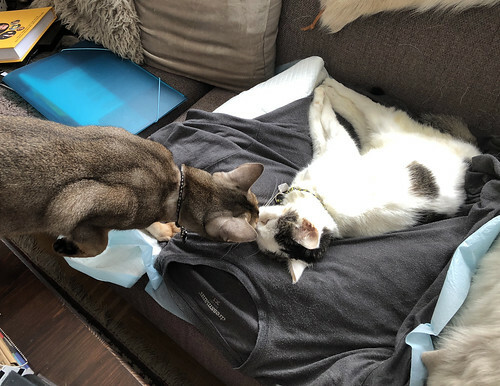 After Mango died twenty-eight months ago, his companion for over 14 years, a grey & white DSH named Bubbles, started over-grooming to the point of licking all the fur off of her belly and hind legs. It was evident that not knowing what happened to him was a traumatic experience for her. After about six months, she seemed to emotionally stabilize. Well, that speaks volumes in regards to that theory! Very touching description of her journey away. I am so sorry, Coco and Bjorn. It is never a good time to say goodbye, but she is going to a wonderful place and she certainly won’t be lonely. Purrayers as she begins her journey – and for those left behind.